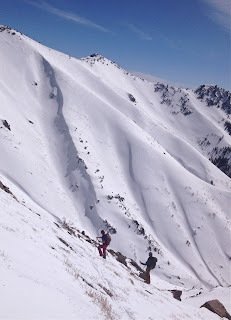 Spring skiing is still in full swing in the Wasatch Range and the Uintas here in Northern Utah. My season still slows down to a certain degree as I add more construction projects into my daily life. Despite the increase in other work, I still find some time to get out into the mountains for skiing. Corn snow is the name of the game this time of year, so early mornings, and sunrises are a staple of the spring corn skiing diet. The high temperatures and strong sunlight cook the snowpack quickly so the aspect and elevation of a particular slope is a key element to harvesting good corn. ^A sliver of moon with a sliver of sunlight. ^I actually started my skinning slightly late. The sun was just starting to show its inevitable arrival in this picture above just above my parking spot. ^I quickly made my way up a 3,000 vertical foot climb to get to this east southeast aspect. Typically the first aspect to get enough warming on the snow to corn up this time of year. I spun a couple of laps on this slope while I waited for the sun work work its way around the compass some more onto the western face of the Ogden Range of the Wasatch. I wanted to scout out a zone on the west side that was also a little bit lower in elevation. ^This is a picture of the higher elevation bowl of the canyon I wanted to scout out which is also a west northwest facing slope. North through northwest are the very last slopes of the day to corn out typically, so I had some timing games to consider for later in the day. Mostly due to the elevation differences in the primary scout mission zone on the west side and this slope I would want to ski before getting to it. The lower elevation zone, although also west through northwest on the compass, is lower in elevation then this west northwest bowl higher up above it. After a couple laps on the morning east southeast slope I popped over the ridge to see how this western side was shaping up. This top bowl pictured above was taking a long time to heat up. Also, a slight wind was slowing the corn cycle even more on it. I took my time, ate some food, waited for the corn, and simply enjoyed the 360 degrees of scenery. ^Pineview Reservior to the northeast. 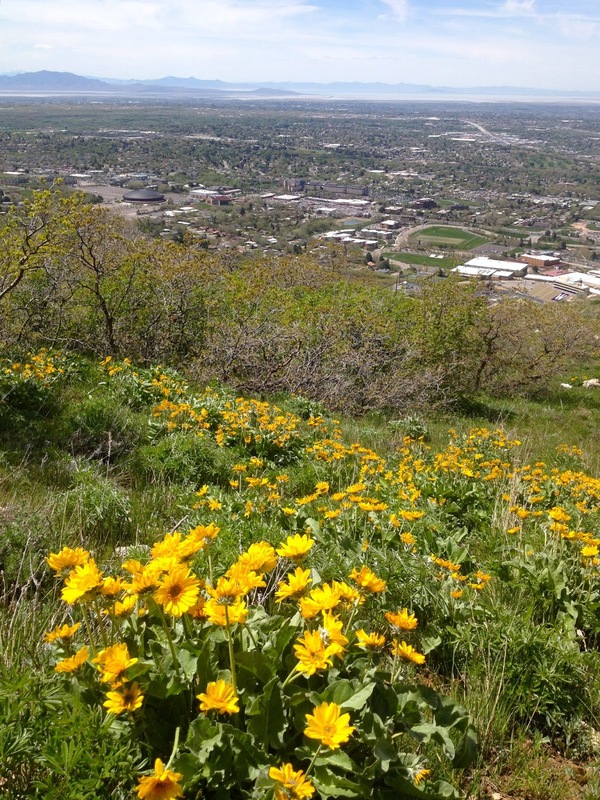 ^The rest of the Wasatch to the south. ^Needles Peak, Demoisey Peak, and the distant Uinta Mountains to the southeast. ^Realizing that I would have some significant time until the west northwest bowl I was waiting for would be a while until it went into corn cycle I decided to take a lap on this south southeast facing slope pictured above. It sits just behind the bowl I was waiting for. I punched a boot pack in to get back up to where I took this picture of my tracks on the line I had just skied. That killed another hour of my time while I waited for corn in the bowl. However, when I got back to the ridge I came to the conclusion that the slight breeze at higher elevations was going to hold off the corn from forming in the high bowl. So with my true objective being one of many west through northwest facing slope options at a lower elevation in the canyon I may have to ski the high bowl in frozen conditions. The lower elevation shots were not subjected to the breeze, were seeing lower elevation temperatures, which are higher because it is lower, and thus were likely already entering the corn cycle already. 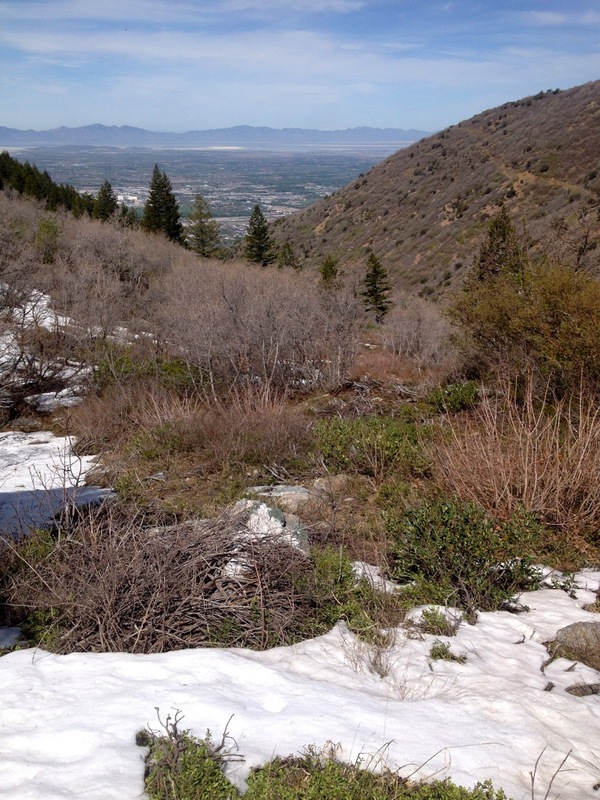 The deal with the corn cycle is if you are too late, then the snow gets sloppy wet and the likelihood of wet snow avalanches begins to increase as it gets hotter and the snow continues to get more wet. Therefore, I decided to ski the high bowl a bit too early for good corn in order to get onto the lower elevation slopes before they started to "go off wet" as we like to say. ^Thankfully that was the right call because after I skied the firm high bowl and got to the point that I snapped the picture above I had a roughly 800 vertical foot climb to make to get to the terrain pictured in the background. I opted for a chute I have scouted with binoculars from my house many times that is directly west facing. 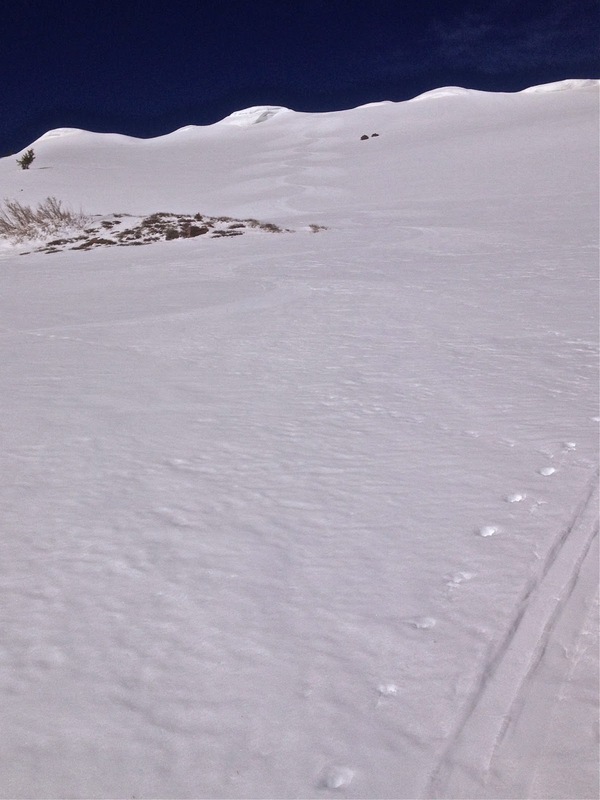 It is hidden from this picture's vantage point on the left, but it was in perfect corn when I got too it and skied it. I am calling it "Snakey Chute" due to it's winding nature for the roughly 1500 vertical feet that it runs. The last 300 vertical feet were actually starting to get pretty wet, which reassured my decision to skip waiting for corn in the high bowl to get down to this area. ^At the bottom of Snakey Chute the snowpack was nearly fully melted out at about 7000 feet above sea level. 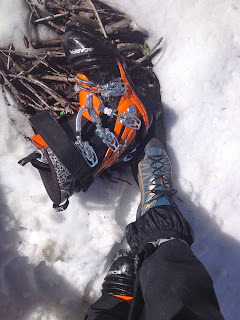 I made the glorious switch from ski boots to hiking shoes that always provides such relief. ^However, part of the questions I was trying to answer with this particular scout mission of this particular zone was the viability of a down hike exit route to Ogden City. There are no summer trails up inside the higher elevations of this canyon to simply get onto and jog out the exit route. I had an old clear cut with no trail in it that the landowner cut into the hillside many years ago by now that is super rugged to begin with, and heavily overgrown by now as well. Along the south wall I knew the cut was relatively clear and curled back to a good summer trail two small canyons to the north. The south wall cut can be seen in the picture above meandering up the south face. There is no trail on it either, but it has managed much less overgrowth due to its southern exposure. 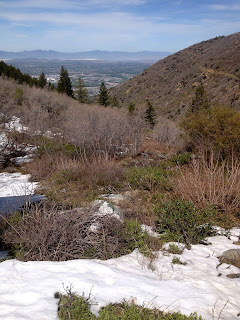 This day though I wanted to see if the cut along the north facing side of the canyon was still clear enough to get all the way around the tight canyon section below that is impassable if I tried to follow the creek drainage all the way down to the Ogden City East Bench trail system. I know that it is just far too tight down there from previous summer scouts in the lower sections of the canyon. 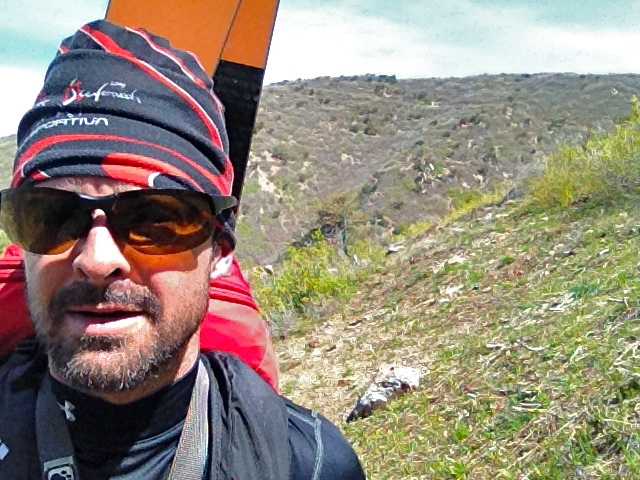 ^All geared up into my pack on my back and I stepped off into the bushwhacking unknown of the old cut. At this point I was out from underneath any avalanche terrain so all I had to worry about was time and energy. Bush whacking, although incredibly strenuous, is simply a matter of time and energy. ^The cut became more and more vague with overgrowth from about here on to the descending ridge that is the near horizon line on the left side of the picture above. I had to traverse this dry forested slope because the bottom of the canyon is impassable, which you can see in the picture above displayed by the visibly tight turns of the canyon on the right side of the picture. Down inside those tight turns are steep creek walls with rushing spring melt off water cascading over multiple small waterfalls. The cut did aide my traverse for much of the way until about the last 500 yards. At that point the traversing was basically a slash and push endeavor. Slashing at the scrub oak with poles and pushing myself and heavy gear through the resulting openings in the dense undergrowth. A skill we lovingly call bush whacking. 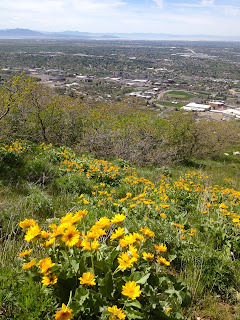 ^Dripping sweat and scratched up I busted out of the thickness above this field of wildflowers just above summer trail access to a north and south running trail nestled perpendicularly with the bottom of the canyon. The relief of the sight of the open field was in abundance after the punishing bush whack. At this point I was all smiles because the hardest part was over. A simple scamper down through the wildflowers, a short summer trail trek, and then a trailhead pick up was all that awaited me at that point. I had rallied my mother-in-law to hook me up with a ride back home. 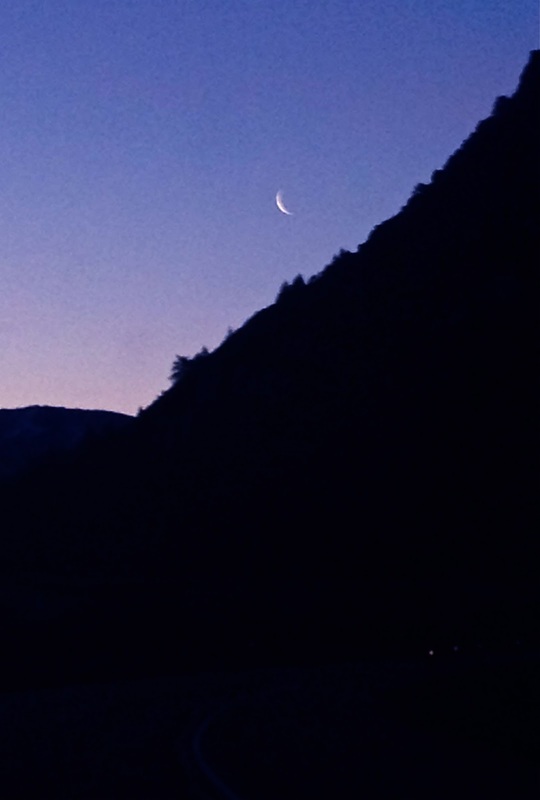 While I awaited her arrival, and explained my ski gear to every passing hiker and biker, I relished in my adventure's successes in the scouting. My exit was indeed punishing, but the knowledge I gained will save me dearly when the exit risks are higher in next year's mid-winter snowpack. Even though the route I hoped would work out for me did not exactly pan out it simply serves as learning. Now I know that the route I did not take this particular day up the south wall of the canyon is now the more likely option to use in the future. In this game a strike out can be just as useful as a home run. The beating makes me stronger, the knowledge makes me smarter, which both serve to help make sure the next time I come into the zone will have a chance to be that much better. As I like to say… scouting pays.